My brother-in-law has been talking about sustainability quite often with me, especially when it comes to choosing where I shop. He’s also dived into eating no meat and all that other stuff that contributes negatively to our pretty world. And it certainly has me thinking about how I can take on a more sustainable lifestyle. I admire those that take on a completely sustainable lifestyle. But when I think about where I am, what my passions are, and how I can satisfy those passions, I can’t fully dive into that lifestyle. My passions revolve around style. I’m attracted to the latest trends and want to style those trends both for myself and for my blog. And to keep up with the latest trends, requires a bit of shopping every month or so. See where I’m going with this? Sustainable fashion is beautiful and ideal but pricey. And as someone that’s constantly building and changing and cleaning out their wardrobe, it’s just not possible with my current financial means to shop 100% sustainable all the time. But before you go and get mad at me for not going all in, here’s what I (or you!) can do. Life is all about give and take. If I’m not able to always shop from brands that are sustainable, then I can do other things in my life that are and that contribute in a positive way to our world and environment. Cause hey, we only got one. 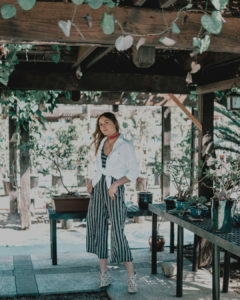 So if you’re a fast fashionista, here are some ideas to that will allow you to still get your fashion fix while thinking about the world you live in. Also, I’m not an expert on this! I’m just a woman caring about the world we live in and wanting to do my part to help it no matter how small. I’m also not perfect and getting into this groove is something I constantly have to think about. But nobody’s perfect. At least that’s what Hannah Montana taught me. Old clothes that we throw away sit in landfills for hundreds of years before they decay releasing harmful gases into the air. There are many more benefits for the environment to shop second hand but that’s a good one to throw out there. So let’s say you shop once a week, once every two weeks, or once a month (I promise I’m closer to once a month). Try to make every other shopping trip at a second-hand or thrift store. And if you’re giving away clothes, be sure not to just throw them out. Drop them off at your nearest Good Will or Buffalo Exchange or any place you want that isn’t your trash can. Hang dry more things. Don’t turn the lights on when the sun is out and shining. Sit outside more! Don’t leave the heat or air on while you’re not home. These are easy things you can do that don’t require a lot of energy (get it??). Eating meat negatively impacts our environment in a lot of ways! Not form literally eating the meat, but from all the things that happen to it before it gets to your table. Going meatless just way day a week can conserve a ton of water, reduce your carbon footprint, and more! This is something I have definitely been trying to do and more than one day a week. Also, vegetables are yummy! Check out some delicious vegetable-based recipes on my Pinterest below! Not all sustainable brands have an overly high price tag. There are some out there that are really reasonable and will still allow you to keep up with the times and trends. Or you can find great staples like white t-shirts from these brands which will last you much longer than those ones from Forever 21 and will have been made in a way that’s better for our environment.